2 What will I learn in this lecture? 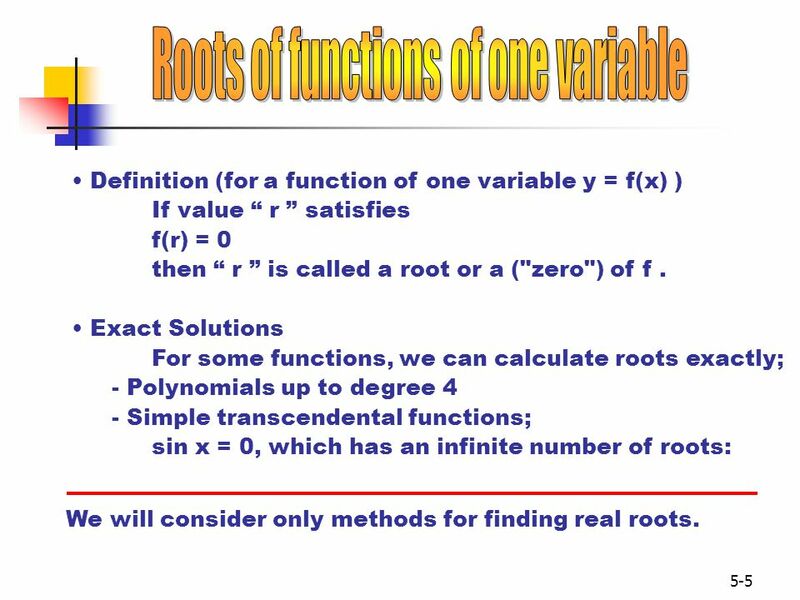 • Definition (for a function of one variable y = f(x) ) If value “ r ” satisfies f(r) = 0 then “ r ” is called a root or a ("zero") of f . • Exact Solutions For some functions, we can calculate roots exactly; - Polynomials up to degree 4 - Simple transcendental functions; sin x = 0, which has an infinite number of roots: We will consider only methods for finding real roots. 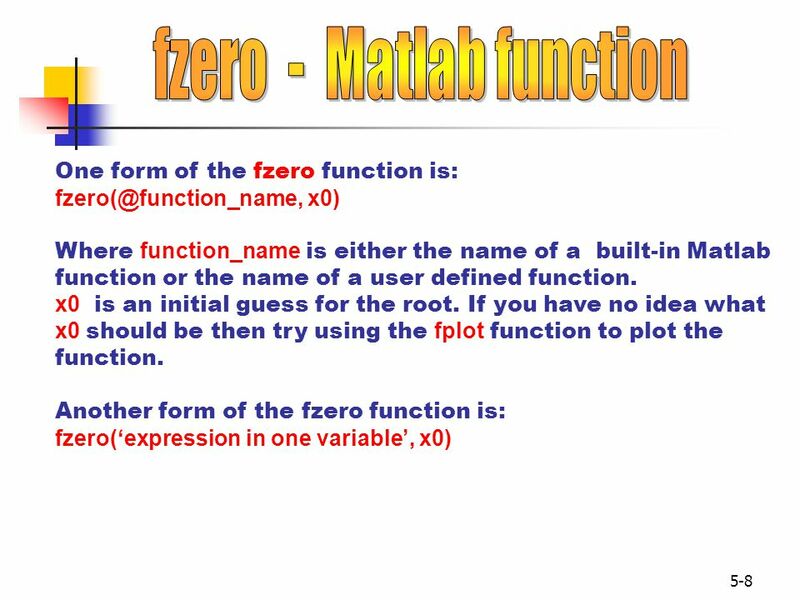 fzero -- built-in Matlab function for finding one root for a function y = f(x) that has only one variable. 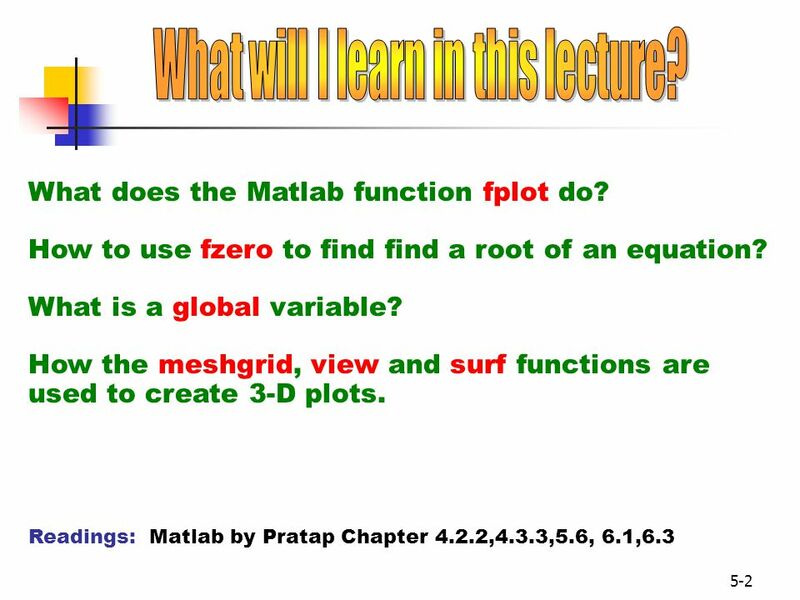 (see Matlab book 4.2.2, 5.6) Requires a starting point. The function f must be continuous. Fast convergence! Works with polynomials but will return only one “real” root if it exits, so use the roots function for polynomials. 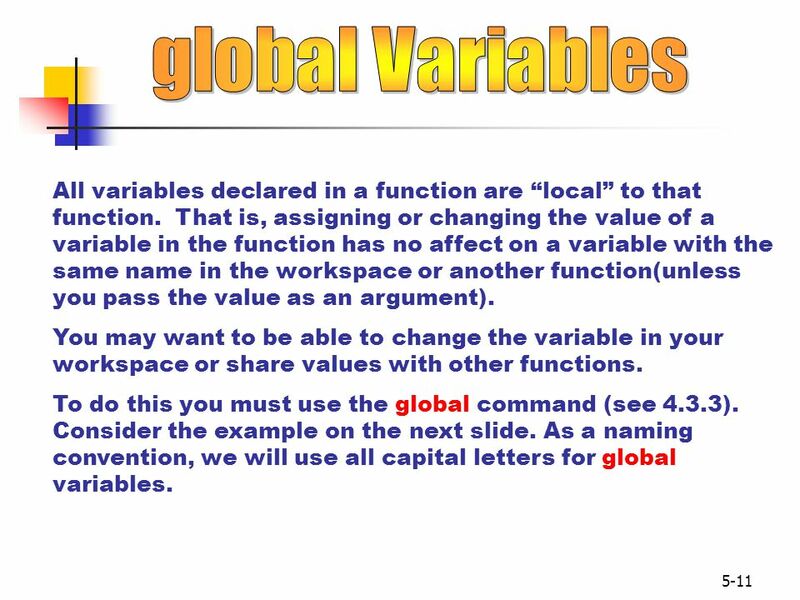 11 global Variables All variables declared in a function are “local” to that function. That is, assigning or changing the value of a variable in the function has no affect on a variable with the same name in the workspace or another function(unless you pass the value as an argument). You may want to be able to change the variable in your workspace or share values with other functions. To do this you must use the global command (see 4.3.3). Consider the example on the next slide. As a naming convention, we will use all capital letters for global variables. Write a function named total that returns the sum of the values passed to it though the input variable x. 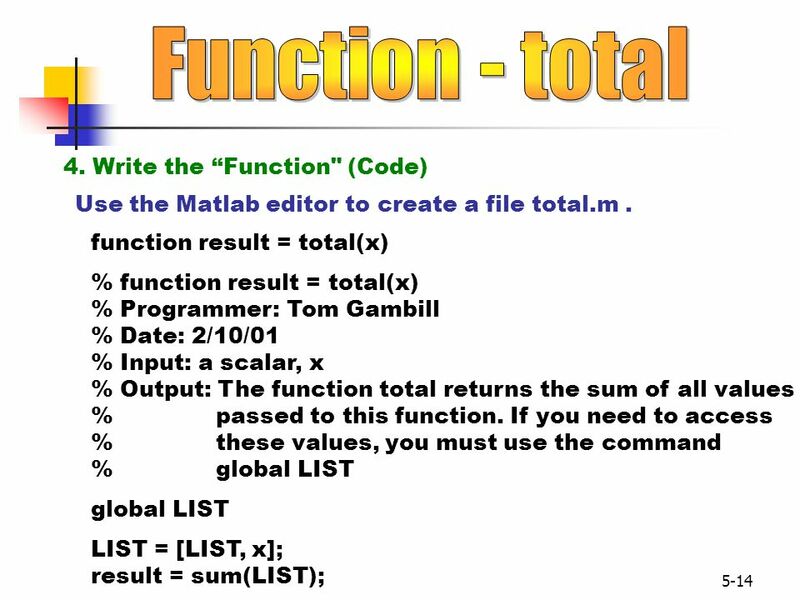 The function total also appends the value of x to a global variable named LIST. 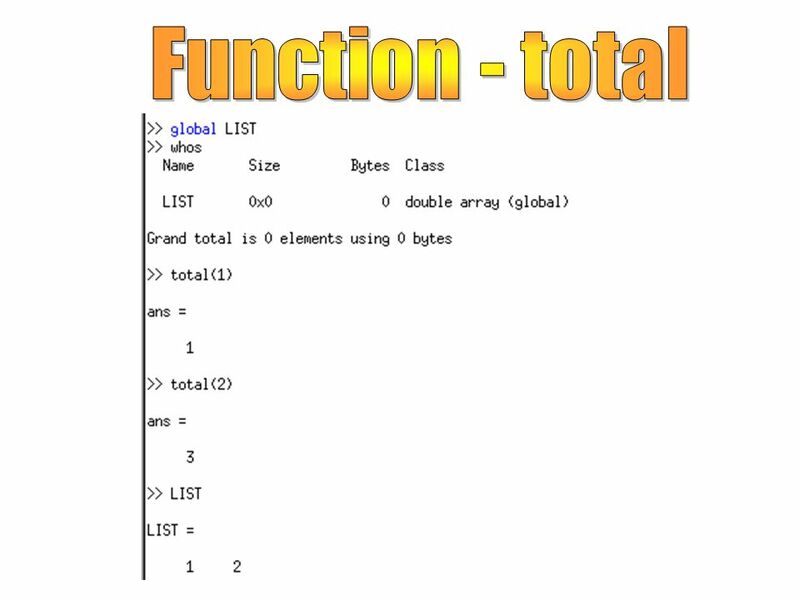 LIST contains the history of values passed to the function total. 2. 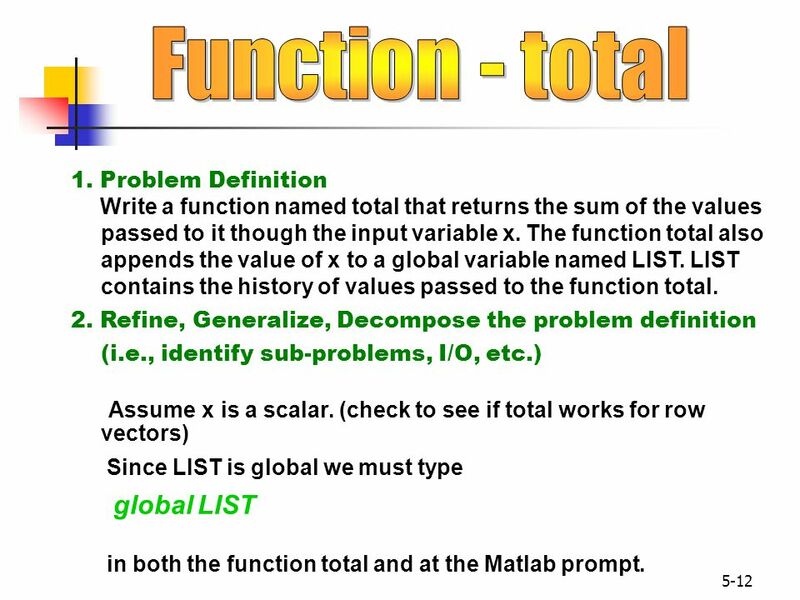 Refine, Generalize, Decompose the problem definition (i.e., identify sub-problems, I/O, etc.) Assume x is a scalar. 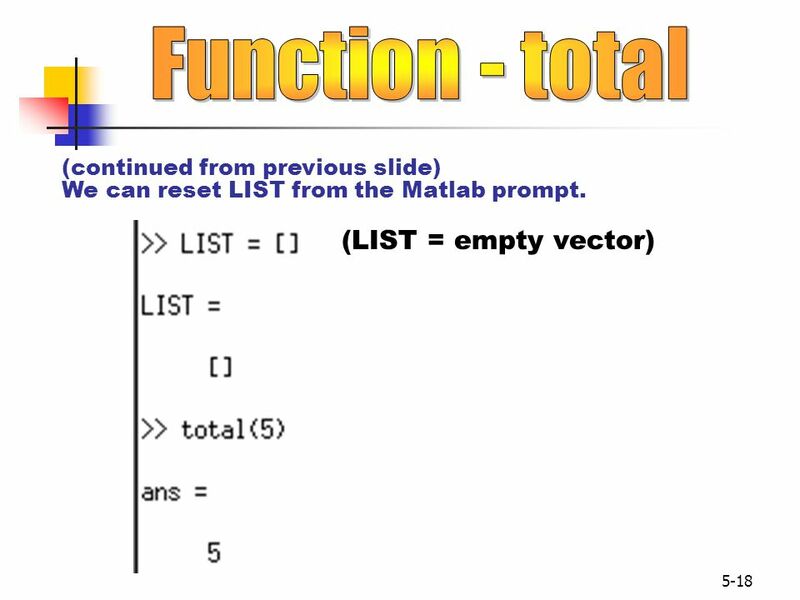 (check to see if total works for row vectors) Since LIST is global we must type global LIST in both the function total and at the Matlab prompt. Note the execution sequence on the next slide. 6. 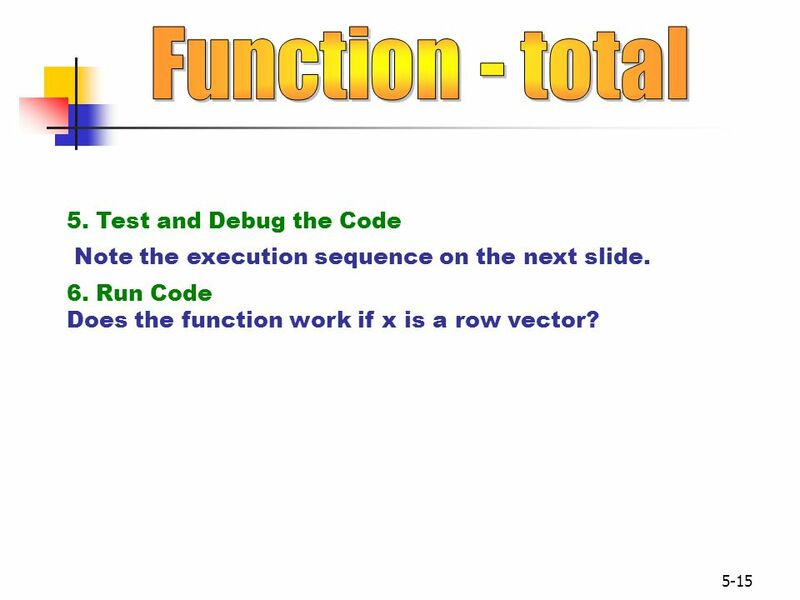 Run Code Does the function work if x is a row vector? 26 What have I learned in this lecture? 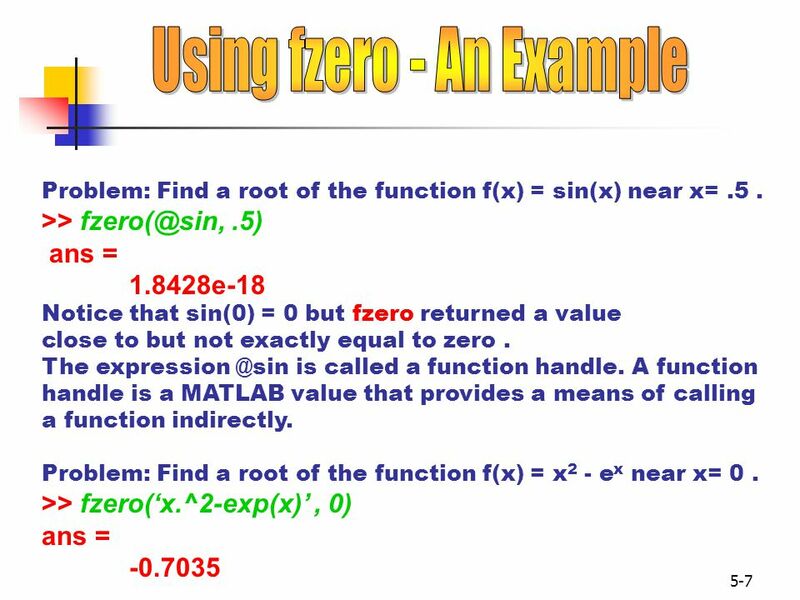 We can use the Matlab functions fzero to find zeros or roots of a function of one variable. 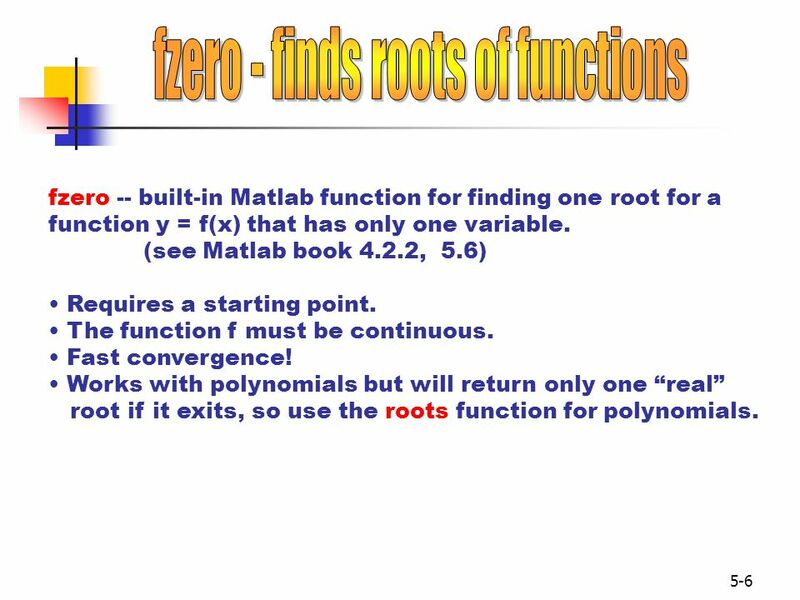 The function fzero is generic but finds only one root, the function roots applies only to polynomials but finds all roots. The function fplot is used when you have an explicit function, (user defined or built-in). 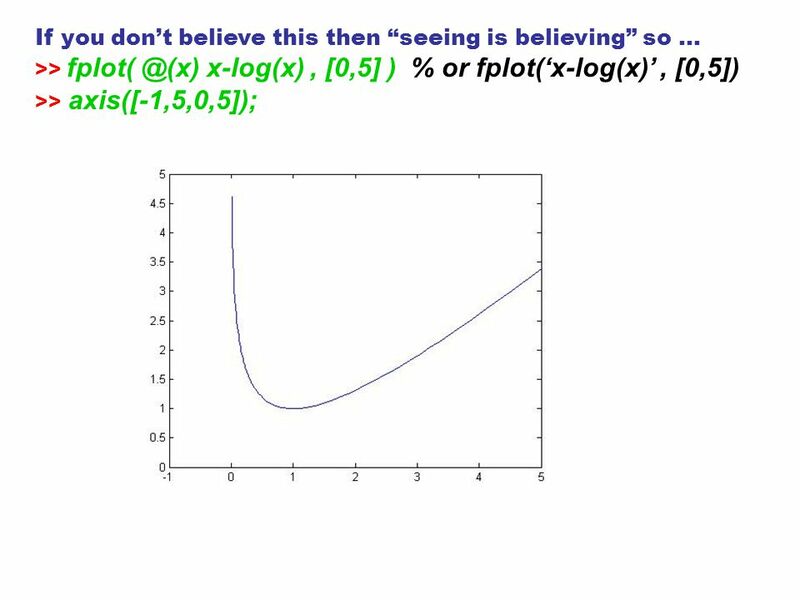 The plot function can be used for both explicitly defined functions and raw data for which we don’t know the functional relationship. The global command allows more than one function to share(access) a single copy of a variable. You can also share the global variable with the active workspace. 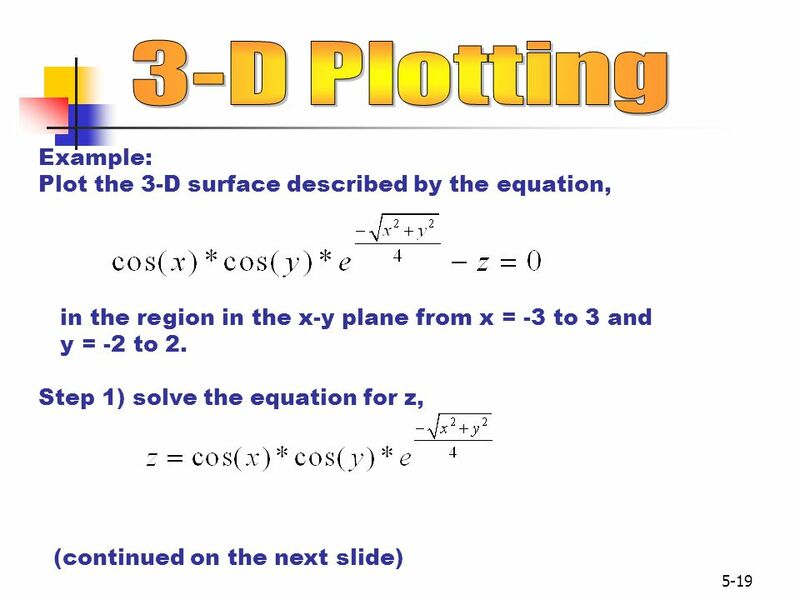 3-D plots can be done in a 5-step process using the built-in functions meshgrid and surf . 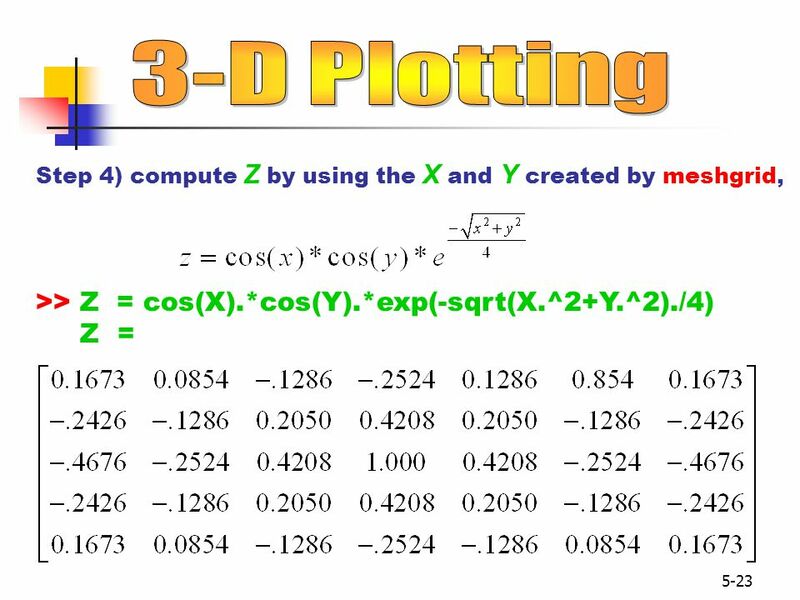 MATLAB – A Computational Methods By Rohit Khokher Department of Computer Science, Sharda University, Greater Noida, India MATLAB – A Computational Methods. 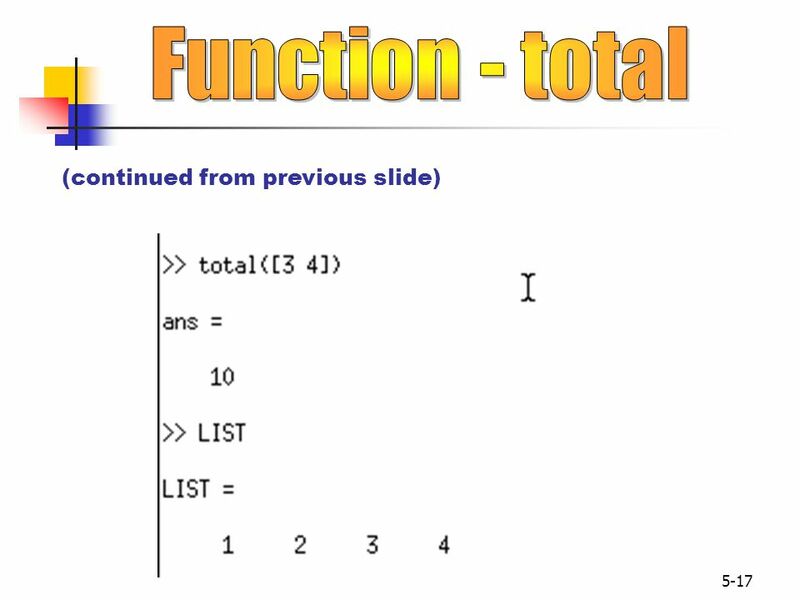 Lecture 14 User-defined functions Function: concept, syntax, and examples © 2007 Daniel Valentine. All rights reserved. Published by Elsevier. 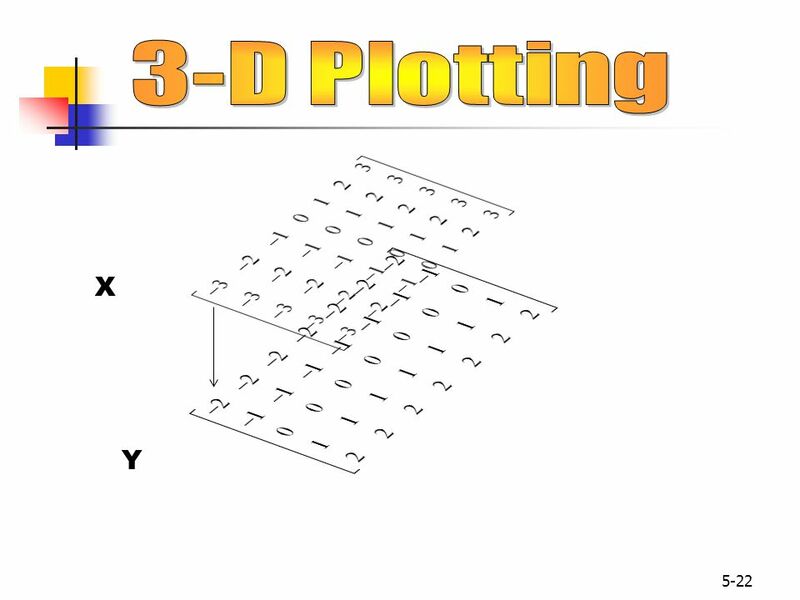 CSE 123 Plots in MATLAB. 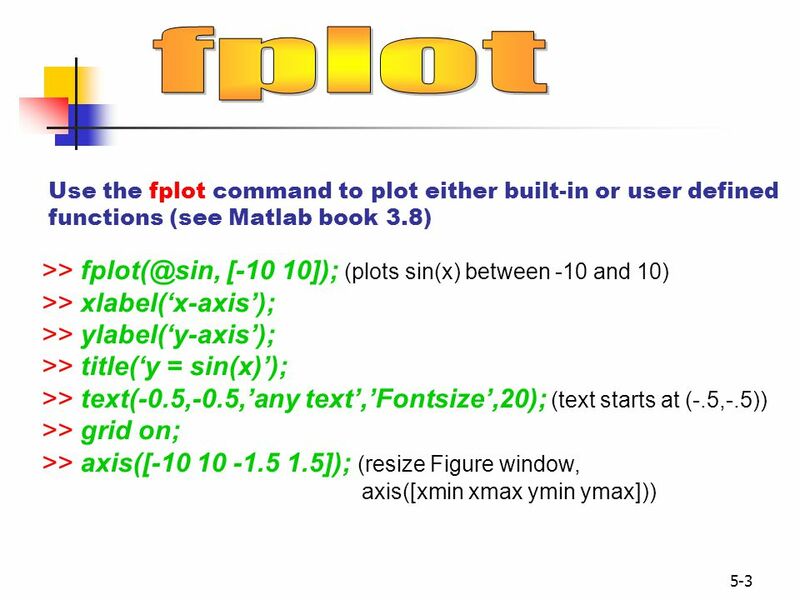 Easiest way to plot Syntax: ezplot(fun) ezplot(fun,[min,max]) ezplot(fun2) ezplot(fun2,[xmin,xmax,ymin,ymax]) ezplot(fun) plots. 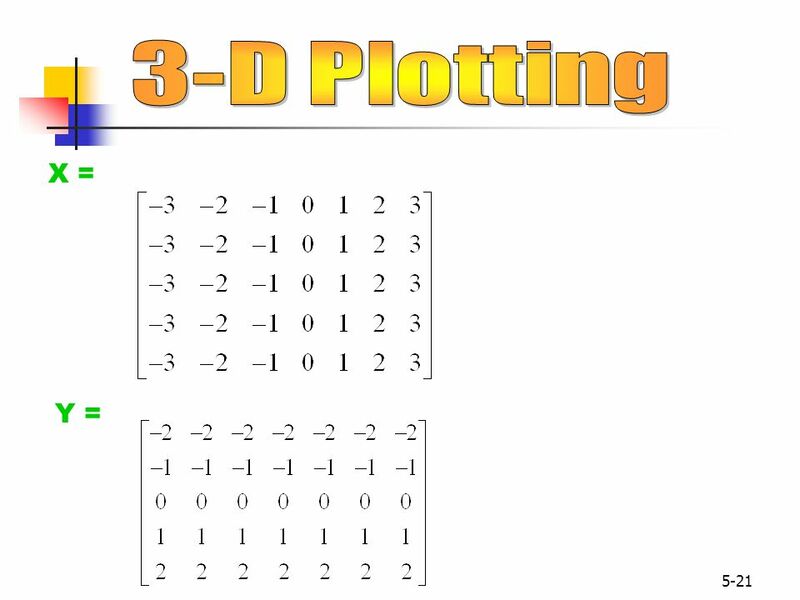 Introduction to Engineering MATLAB – 11 Plotting - 4 Agenda Multiple curves Multiple plot. 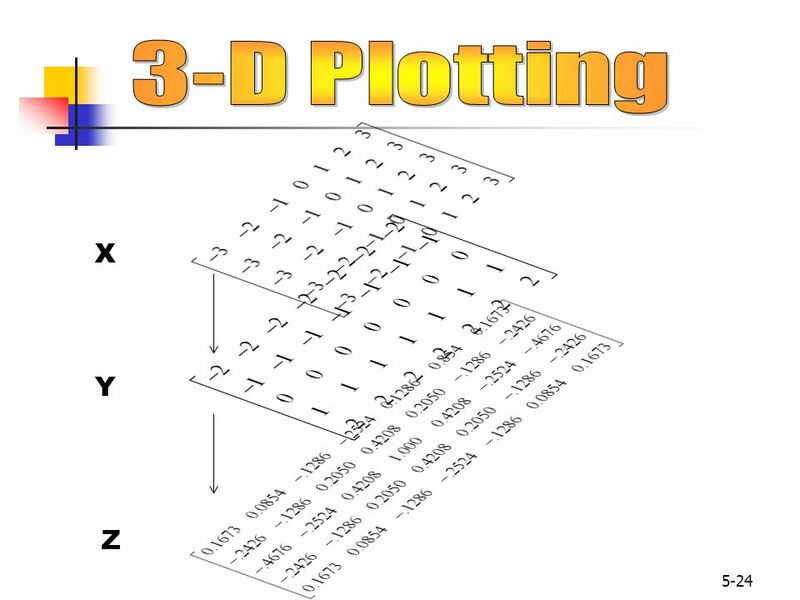 Introduction to Graphing Using MATLAB. Line Graphs  Useful for graphing functions  Useful for displaying data trends over time  Useful for showing. 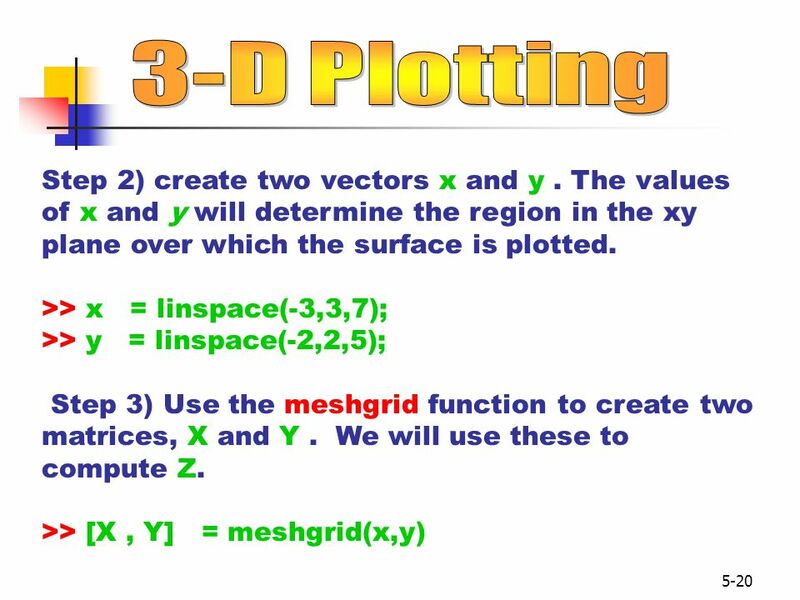 Matlab Graphics S. Awad, Ph.D. M. Corless, M.S.E.E. E.C.E. 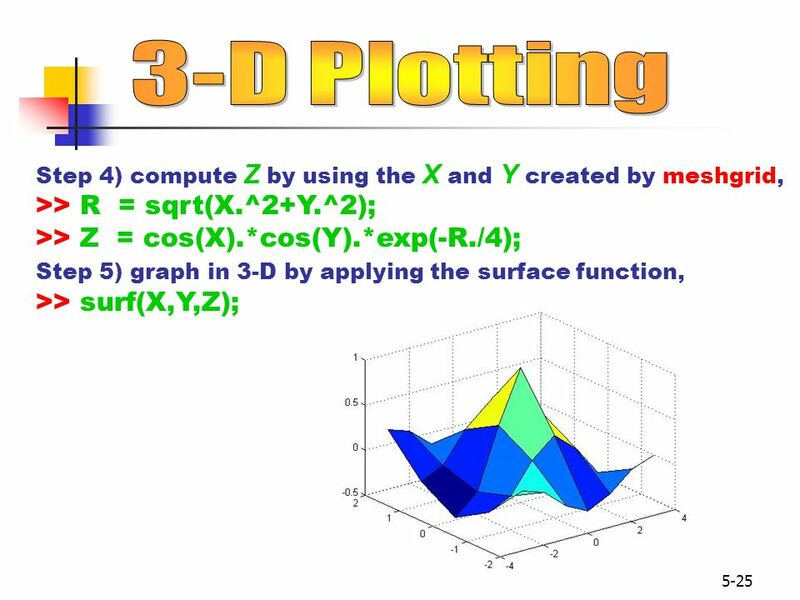 Department University of Michigan-Dearborn Introduction to Matlab: 2D Graphics. 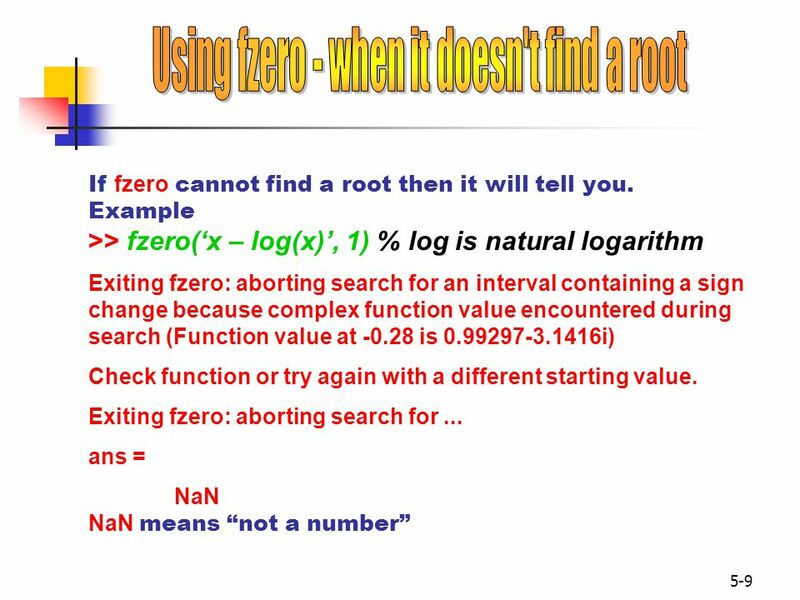 Engr 0012 (04-1) LecNotes Engr 0012 (04-1) LecNotes Functional analysis y = f(x) things to do 1. sketch graph 2. find roots (zeros) 3. find. 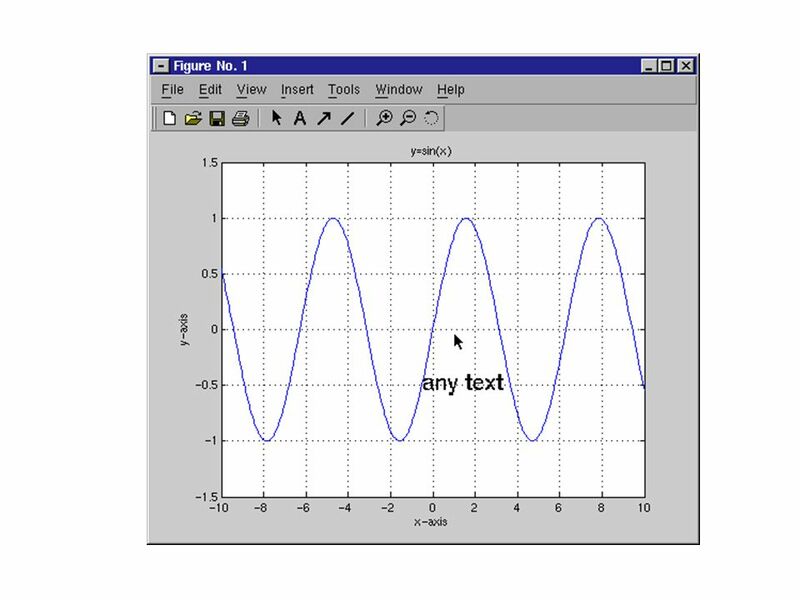 1 Chapter 4 Curve Plotting with MATLAB MATLAB provides some very powerful features for plotting and labeling curves. These operations can be performed. 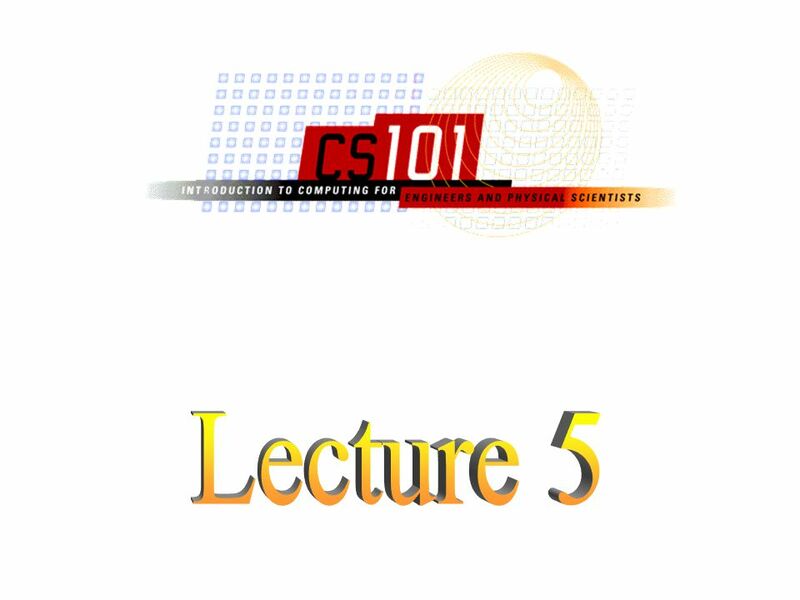 Introduction to MATLAB for Biomedical Engineering BME 1008 Introduction to Biomedical Engineering FIU, Spring 2015 Lesson 2: Element-wise vs. matrix operations. Suggested problems from text (6 th edition) Chapter 3.1 p85 Problems 1, 4, 9, 10 Computer problems 1, 2, 4, 7 Chapter 3.2 p101 Problems 4, 15, 17, 19 Computer. 3-2 What are relational operators and logical values? How to use the input and disp functions. Learn to use if, if-else and else-if conditional statements. Exam #3 Review: Comprehensive Exam Class 14.2 Palm Matlab Book Ch. 1-5. Dr. Jie Zou PHY Welcome to PHY 3320 Computational Methods in Physics and Engineering. 12-2 Know how if and switch C statements control the sequence of execution of statements. Be able to use relational and logical operators in the conditional. Solving Quadratic (and polynomial) Equations by Factoring. 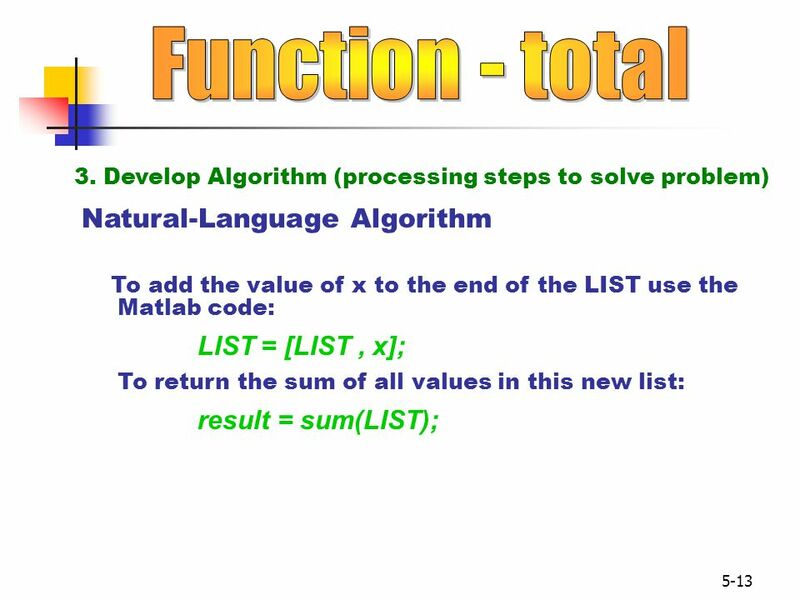 Introduction to programming in MATLAB MATLAB can be thought of as an super-powerful graphing calculator Remember the TI-83 from calculus? With many more. Copyright © 2005. The McGraw-Hill Companies, Inc. Permission required for reproduction or display. 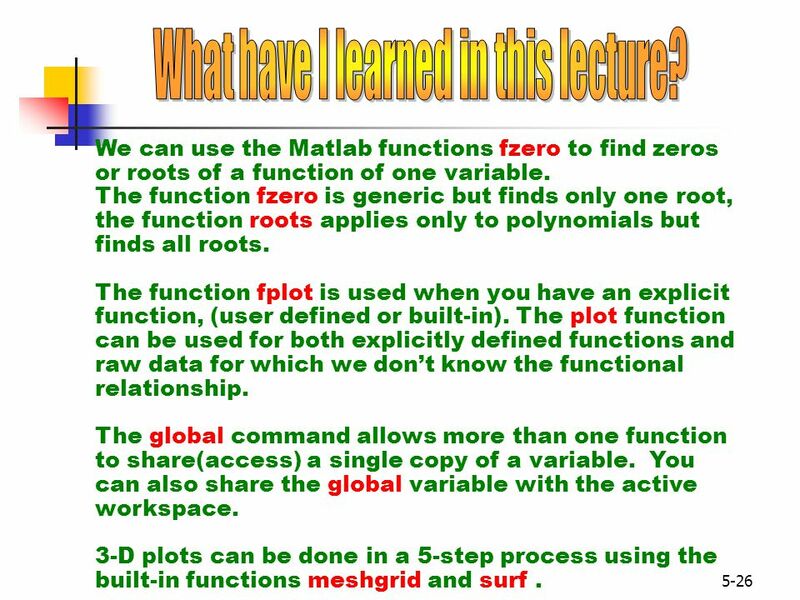 A Concise Introduction to MATLAB ® William J. Palm III.